At last, I have the time to watch a movie. There were only 4-5 person in the cinema and it was horrible being the first who stepped into a dark cinema. I gotta switch on my handphone to provide some light in order to find my seat (however it was pretty useless as I found out that there were only 4-5 people in the cinema). The movie I watched was “The Devil Wears Prada”, I didn’t get to read the novel before entering the cinema hence I was watching with 0% expectation. Sometimes it is good to watch with no expectation because you will be getting better experience and more interested (I shouldn’t have read “The Da Vinci Code” before entering the cinema). 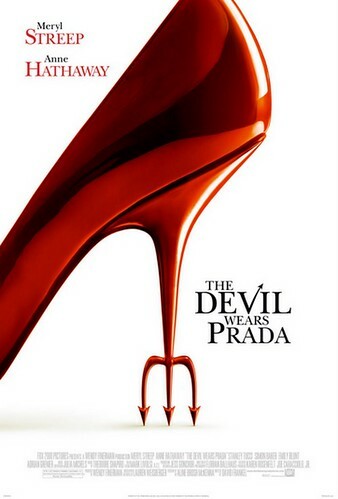 Let’s talk about the movie, somehow I dun find the story suits the title “The Devil Wears Prada” because Miranda Priestly (by Meryl Streep, which was the boss) wasn’t mean enough. I meant she was just a typical superior that demands better productivity. I find her quite fair in promoting people who are able to do their job right as well. Andy (a.k.a. Andrea) Sachs (by Anne Hathaway, yes, she acted in the brokeback mountain just in case you wanna know) in the other hand, was both a fortunate and unfortunate person. She was fortunate for being able to discover her abilities that she didn’t even aware of, she was fortunate because she knows how to dress herself in a better way as well. She was unfortunate because she seems like one got forced by the reality and her own ambition. However, blaming the reality for pushing her is not that fair though because she can just give up at anytime, not that she had not given any chance to give up. Seriously speaking, if she is considered unfortunate, maybe we should look at the point where she had no life for herself in the movie. Maybe this is the sacrifices that she gotta make to achieve. For other actors, there are nothing much that I can talk about because I didn’t have enough time digesting the politics in the movie. However, I should say fortunately I know what happened roughly. One thing that I would like to share mebbe is not very suitable with that makeup, she has the potential acting in a horror film if she really do make ups like that in the future.